“Time moves different when something you ain’t ‘specting to happen goes ‘head on and happens anyhow. I seent where time goes from moving at the reg’lar schedule to when it slides ‘long on grease locomotive rails. I also seent where it slows right on down, like it’s fighting its way through a big invisible jug of molasses. Trouble is I can’t figure what it is that makes one thing move fast and the other slow. For a sample, if you was to ax me afore I seent what happened to Pap, I never would’ve thought time could slow down in the way it done. It was something so turrible that I’d-a give anything to make it go by faster, or better still, make it so I didn’t never see it at all. As ‘shamed as it make me feel and coldheart as it sound, I wish I’d-a jus’ run ‘crost Pap laying at the foot of that old maple with that big gash setting like a extra smile ‘crost his forehead. If I hadn’t been cursed to see what happened with my own eyes, it probably would’ve been nigh on useless to try and figger how my pap come to be laying there, but I’d trade being ignorant ‘bout it in a hop, skip, and a jump if that meant the sight of him wouldn’t be barging into my dreams no more. Only a small portion of Americans living in the Antebellum South benefited from slavery. The scarcity of public education in the South and an omnipresent propaganda campaign about the inferiority of blacks caused ignorant, poor, whites to support the institution of slavery, despite the fact that it was contrary to their own economic interests. If it were not for slavery, working class whites would have been able to demand higher wages, as they could in the North. 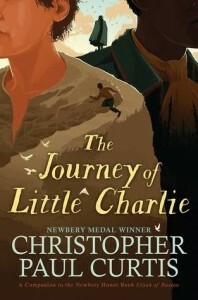 In THE JOURNEY OF LITTLE CHARLIE, a coming-of-age story set in 1858, Christopher Paul Curtis creates a pair of unforgettable characters whose ignorance and exploitation represents the white people victimized by the Southern Oligarchy. A few years after the story takes place, so many of these same whites would lose their lives in the oligarchy’s last desperate gasp attempt to maintain low labor costs. Little Charlie is a huge, uneducated, twelve year-old son of sharecroppers, and Cap’n Buck is the overseer for Mr. Tanner, who owns the property that Little Charlie’s parents used to own but now rent. When a shocking bad break leads to the accidental death of Big Charlie, Little Charlie’s dad, Cap’n Buck exploits the situation by falsely claiming that he’d fronted Big Charlie a chunk of money. Little Charlie is forced to participate in a scheme to go north to Detroit with Cap’n Buck to help kidnap a family of escaped slaves. Despite his dire situation, Little Charlie’s liberation from the farm broadens his horizons and helps him overcome many of his ignorant assumptions. Through Little Charlie’s journey, we come to understand the misinformed thinking of poor white, Southerners, and how unfortunate their lot was. An incident in the story brings up an incredibly interesting piece of medical history: rickets. I now understand why my physician tells me to take a daily Vitamin D supplement to make up for what I don’t get nutritionally through my vegan diet. THE JOURNEY OF LITTLE CHARLIE is the most powerful story that Christopher Paul Curtis has written to date. Curtis’s award-winning stories for young people have now spanned more than two decades, a career longevity that puts him in a league with Roberto Clemente, Kareem Abdul-Jabbar, and Wayne Gretzky. I hope there’s a Children’s Literature Legacy Award coming his way sometime soon! When Dad swung the axe into the tree, he didn't expect that sharp blade to smash into a stone lodged in the wood. He didn't expect the blade to come flying back and take his life away. But it did and that leaves Mom and Charlie, what's left of a sharecropper's family, to pay the debt the family owes. When the overseer comes to their home, it's Charlie he wants. He has a plan for the two of them to head off north to find the people who ran off with thousands of dollars worth of treasure. Charlie finds out hundreds of miles later that they are actually searching for some runaway slaves. The horrors of slavery, understanding others, standing up for what you believe these are the mileposts on the journey Little Charlie is going to make as he heads toward Canada. A gritty, dark journey through the truth of the American past.